When Hurricane Sandy slammed into the East Coast in late October 2012, the veritable superstorm left a trail of devastation in its wake. People lost their lives, their homes. Businesses were leveled, towns destroyed. And thousands of pets, those with homes and without, became some of the storm’s most vulnerable victims. 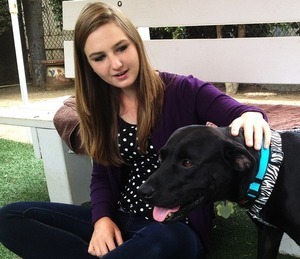 Labrador Retriever mix Rio, who has terminal cancer, with her new owner Heather Bardin. Beautiful black Labrador Retriever mix Rio was one of 49 homeless animals and Sandy survivors flown across the country to the Helen Woodward Animal Center (HWAC) in Rancho Santa Fe, California last November after the shelter she’d been living in was demolished by the East Coast storm. Immediately, staff at the shelter could tell 5-year-old Rio was something special, and couldn’t wait to give her the second chance she’d been waiting for. “Rio is an incredibly affectionate dog with the people she gets to know and love,” HWAC Pet Trainer Rob Kuty tells the Rancho Santa Fe Review. But an examination by a veterinarian revealed the young and lively Lab was suffering from lung cancer, and that her tumors are inoperable. Though she’d survived the largest Atlantic hurricane in recorded history, she would not survive the cancer growing in her lungs for much longer. Doctors gave the young Lab only months to live. “We wanted to get them all into families, and when we did the exam on Rio we found out that she had terminal cancer,” HWAC representative Jessica Gercke tells CBS News 8. Still, despite Rio’s grim prognosis, her caretakers were determined to get the loving Lab the happy home she deserves, a family with which she could live out the last bit of her life. After learning of Rio’s story and hoping to encourage a family to adopt her, the Albertson’s/Sav-On Pharmacy in nearby Del Mar, California offered to dispense Rio’s medications free of charge for the remainder of her life, and Blue Buffalo will supply Rio with plenty of dog food at no cost to her adopters. No sooner had staff at the HWAC put out the call for adoption that offers started pouring in. “We started getting applications from as far away as Washington, D.C., Alabama, Utah,” Gercke says. But doctor’s orders stated that Rio must go to a family nearby, as too much travel could exacerbate her condition. That’s when La Mesa pet trainer Heather Bardin submitted her adoption application, eager to add Rio to her family. Bardin and her retired parents had seen a local news story on Rio and thought she’d make a great addition to the family and a wonderful sister to Bardin’s other rescue dog, Liberty. HWAC staff knew immediately Bardin was a perfect match for Rio, and the adoption was finalized on Monday. “I love it. I’m so excited, really excited to bring her home,” Bardin says. “I want Rio to live out however long she has, even if it’s five years or another month, to be in a loving family and have a best friend dog to play with,” she adds.